With the economy encouraging more of us to opt for a staycation, many are discovering that Country Shows in the UK in 2013 offer plenty of diversion for a weekend break. Traditionally showcases for livestock and farm produce, they have grown into major rural festivals with plenty of family entertainment on offer. Forget Alton Towers for once, Country Shows in the UK in 2013 offer more traditional entertainment in the midst of the beautiful British countryside. With the British weather behaving itself, these rural festivals make the perfect weekend mini-break. The New Forest and Hampshire Country Show over the final weekend of July is as upmarket as the area, but offers plenty of options for visitors. A children's cookery and craft competition may attract aspiring bakers or creative sorts. Parents may be more intrigued by the products of the local Ringwood Brewery. The Herefordshire Country Fair takes place at Hampton Court near Leominster on 4 August and puts the emphasis on spectacle. The Knights Of The Damned offer a thrilling jousting display, while the Stannage Motorcycle Stunt Team counter with a Flaming High Dive. 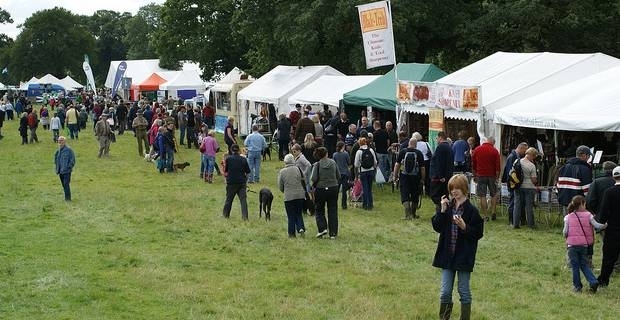 Knebworth might be more familiar as a venue for rock festivals, but its country show, on 10 and 11 August in 2013, offers traditional rustic pursuits, including displays by birds of prey, working dogs and heavy horses. There is plenty of children's entertainment on offer in marquees, as well as lavish catering in the food tents. The burgeoning popularity of Country Shows in the UK in 2013 makes it advisable to arrive early and claim a parking space. Escaping a country show can be a bit of a nightmare on narrow country roads, so plan your route carefully beforehand, and be prepared to miss the results of the dog show if it means getting a head start on the traffic.